Despite making an initial positive impact at Arsenal, speculation suggests that defensive ace Shkodran Mustafi could face an uncertain future at the Emirates. The German international has been a regular fixture over the past two seasons under previous boss Arsene Wenger, making 38 appearances in all competitions in the campaign just gone. Aside from various injury setbacks, question marks could rightly be raised over the defensive vulnerabilities that he has shown at times too. While it’s harsh to attribute all of Arsenal’s defensive troubles to him, there is no denying that he has been part of the problem with the Gunners conceding 51 goals in 38 league games last season, the most out of the top seven sides in the standings. 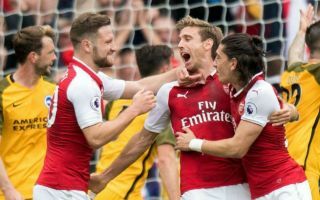 That was arguably a major factor in what saw them slip out of the top four again this past campaign, and so it would come as no surprise if new boss Unai Emery was to prioritise making them a more solid outfit moving forward. According to Calciomercato, not only is Emery linked with a swoop for Borussia Dortmund defender Sokratis Papastathopoulos, but it’s suggested that Juventus could be alerted to the situation as Mustafi could be made available in order to make space for the Greek international. It remains to be seen if such a switch materialises, but with Laurent Koscielny turning 33 in September and now currently recovering from a serious Achilles tendon injury suffered against Atletico Madrid in the Europa League last month, the central defensive area has to be acted upon this summer by Arsenal. From a Juve perspective, with club stalwarts Giorgio Chiellini and Andrea Barzagli not getting any younger, they could do with defensive reinforcements. Nevertheless, Massimiliano Allegri will still have Medhi Benatia, Daniele Rugani and Mattia Caldara at his disposal too.